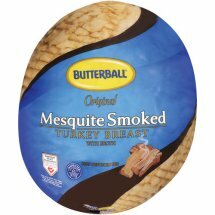 Butterball Original Mesquite Smoked Turkey Breast comes in an easy-open bag! Finally, the days of opening deli bags with a knife and scissors are gone. Butterball brings you a bag with an easy-open safety feature on all their bulk meats. Just follow the quick and easy directions. Turkey Breast, Turkey Broth, Contains 2% Or Less of Modified Food Starch, Dextrose, Salt, Vinegar, Sodium Phosphate, Sodium Erythorbate, Sodium Nitrite.